Groups of stars known as globular clusters provide a test bed to study how stars form and evolve. All the stars in a globular cluster formed at approximately the same time and have the same metallicity, so studying these systems today provides information about the diversity of stellar systems possible. Expanding our knowledge of globular cluster demographics helps grow this parameter space, which informs our expectations as we look at stars that are not part of clusters. The authors of this paper are trying to understand a binary system in the globular cluster NGC 6397. It is known that one of the stars is a millisecond pulsar but it is unclear what the other star is. Previous studies have shown that the companion star is transferring mass to the pulsar, has a mass around 0.25 solar masses, and has a few elements that appear differently than in the rest of the cluster. Two theories for the companion have been proposed. First, it could simply be a low-mass main-sequence star. Secondly, it could have originally been a more massive main sequence star that has lost a significant amount of mass. These theories can be tested by a detailed chemical analysis of the companion star. The first theory predicts the carbon and nitrogen abundances should be the same compared to the rest of the cluster. However, if the star showed more nitrogen and less carbon than other members of the cluster then it likely used to be more massive. NN is the number of nitrogen atoms per volume and NFe is the number of iron atoms per volume. The same goes for carbon. All of these ratios are then compared to the accepted value for the Sun. So [C/Fe] values that are positive mean that star has a higher ratio of carbon to iron than the sun. Negative values likewise mean the star has a lower ratio of carbon to iron than the sun. This definition might seem a little odd, but it provides a nice, easy way for astronomers to standardize and compare abundances of various stars. This figure shows the abundance from the inside out of a theoretical star that started at 0.8 solar masses in this cluster. On the y-axis, the X in [X/Fe] is replaced by N or C depending on which curve you are studying. The dashed lines are the limits to the mass of the companion from other sources. The black triangle and grey box are limits on the abundances from this paper. To determine these values, the authors fit the spectra they collected using models that help turn the strength and width of the absorption lines into abundances. 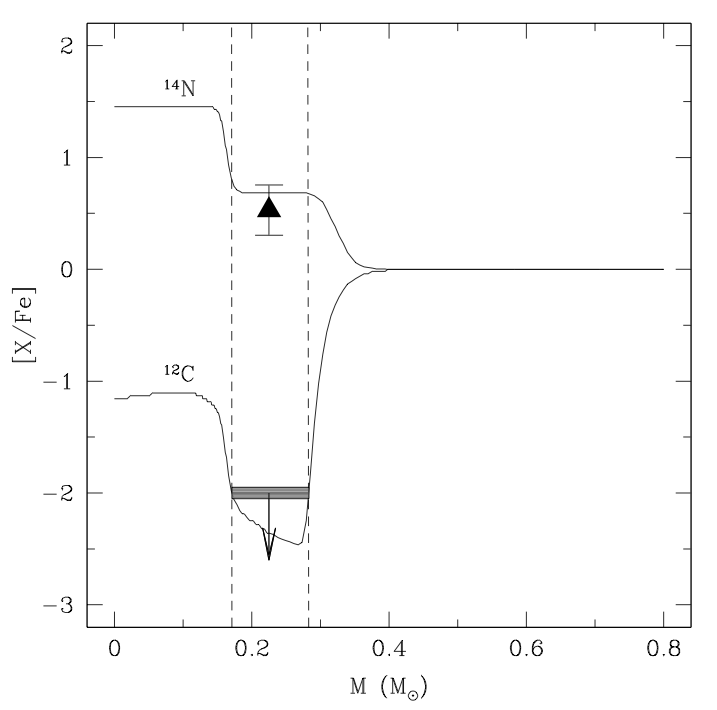 When the carbon abundance was computed, it was immediately noticed that it was too small for the companion to be a low mass main sequence star in this cluster. If it were part of the cluster, it should have the same metallicity. Next, the authors turned their attention to seeing if they could verify the other possibility, that of a stripped main sequence star. The figure to the left shows how this possibility was investigated. Since this companion is in the globular cluster, the authors know the approximate age and metallicity of a possible more massive companion. By assuming an original mass of 0.8 solar masses, the authors evolved a theoretical star to see how it would appear today. The graph shows the abundances of Nitrogen and Carbon of this theoretical star as you move from the center of the star (0 solar masses) out to the photosphere (0.8 solar masses). The dashed vertical lines are the currently accepted mass ranges for the companion. The black triangle indicates the abundance range for Nitrogen determined in this work. The grey box gives an upper limit to the Carbon abundance. You see the predicted values fall within the expected ranges for this theoretical star. Therefore, the authors conclude that the companion to the pulsar must have originally been about 0.8 solar masses, then lost ~75% of its mass to the pulsar. These results supply important information to help characterize this binary system. The methods utilized are independent of any other parameter or measurement from this system, lending credence to the results. Plus, it is quite remarkable that we are able to study and understand a system in which one star has lost 75% of its mass to another star.